Product information "HAIX Mission Black, FS"
works well even on uneven terrain, in unpredictable weather conditions, and during athletic challenges. 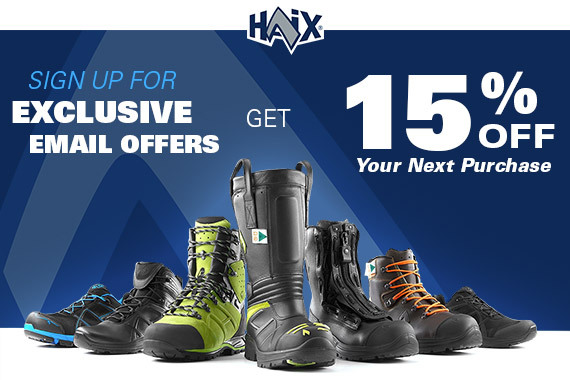 HAIX® Mission boots are just what you need to keep you at the top of your game. HAIX® Mission leather boots has a built in arch support and exceptional shock absorption. Offering you superior support and stability even on unstable terrain. Exceptional ankle support allows you to carry even a large pack of gear and not have to worry about twisting your ankle. The stable boot platform will help you get, and keep, a toehold on rocky, uneven terrain. The two zone lacing of this leather pair allows you to adjust the footwear to your personal liking with the ability to tuck the lace ends into a side pocket. The eyelets allow for smooth movement so you can pull the lace with ease. Even after hours of tension, you can be assured that your laces are still tight in place. Just perfect for those moments when you have to be on the go. Because when you’re on duty where you’re required to be on the go anytime, your boots should be able to do the same too! The inner lining of the HAIX Mission Black is held in place by Secura Liner® making them resistant to pulling out or wrinkling over time. In addition to that, there’s the HAIX® Arch Support system which keeps your foot in its natural ideal position. Proper arch support helps to lessen foot pain. Taking care of your arches now can help to prevent foot and back problems later on. HAIX® Mission tactical boots offer a waterproof GORE-TEX® inner liner to keep you comfortable and dry no matter what. The laminate is waterproof and breathable and is resistant to abrasion thanks to its fleece midlayer. Rest assured, you’ll be able to wear these boots all year throughout all seasons. These HAIX® boots come with a built in HAIX® Climate System keeping your feet at a balanced temperature by regulating it through the vent holes at the top of the boots. This means that your feet are kept cool in warm conditions and warm during cold conditions thanks to the air circulation that occurs with every step. And since the GORE-TEX® liner is waterproof, the drier your feet, the better they are able to maintain a comfortable temperature balance. The Vibram® sole was designed for heavy duty or military use by providing a strong grip and a stable tread. Your feet won’t feel every loose rock or stone in these boots. Because when you’re on the job, you never know what you’re going to step on. Heat resistance, antistatic, and self-cleaning sums up the long lasting durability of a Vibram® sole. Rubber on the front toe and back heel provides an added layer of protection and durability. These boots have what it takes to go the distance. The cushioned insole of the footbed is moisture repellent and anti-bacterial which means you could be working all day and your feet are still fresh. Machine washable and quick drying, your insole can be freshened up quickly and easily. It’s always better to be safe and protected with a highly durable and protective tactical boot like the HAIX® Mission Black. 2-Zone Lacing - Ankle lace lock allows independent lace adjustment between the upper and lower boot. Related links to "HAIX Mission Black, FS"
Our comment on "HAIX Mission Black, FS"
Customer reviews for "HAIX Mission Black, FS"